Mark Zuckerberg is a Married Man! It’s been a busy week for Facebook billionaire Mark Zuckerberg. His company made it’s public debut, a redesign of Facebook is reportedly in the works, and now Mark Zuckerberg has updated his status in classic Facebook style to “married”. 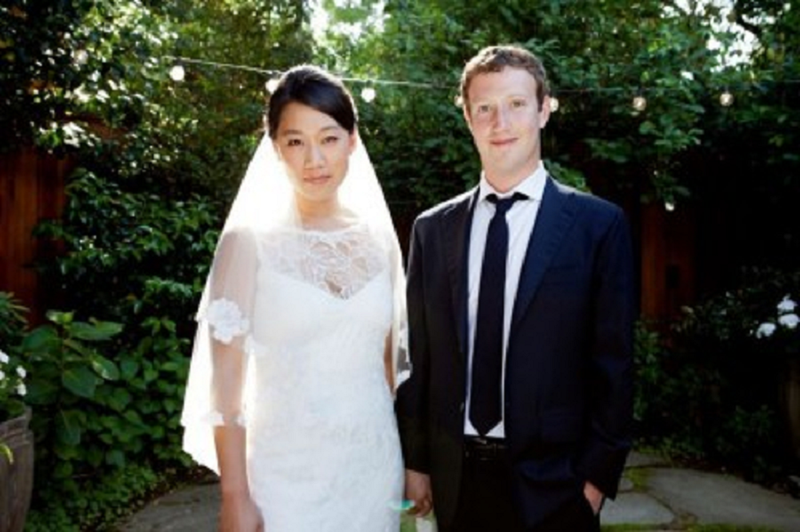 Zuckerberg, 28 married his longtime college sweetheart Priscilla Chan, 27 in the backyard of their Palo Alto home on May 19th. Reportedly, the couple invited 100 guests to what was believed to be a surprise party for Chan who just recently graduated from medical school. Chan received a ruby ring designed by the Facebook founder himself and wore a white dress with a lace overlay by Los Angeles-based designer Claire Pettibone which is sure to spawn some look alike versions. What’s really impressive, is that these stealth nuptials may have been in the works since last fall. Reportedly that Chan may have discreetly bought her dress under a fake name last October. The couple and their surprised guests dined on their favorites from restaurants Palo Alto Sol and Fuki Sushi. For dessert they enjoyed tiny chocolate truffles shaped like mice which they ate during their first date. Congrats to the couple for pulling off their super secret nuptials and we wish the Zuckerbergs all the best in their new life together!